Sometimes I'm not sure if what I see in my children is a result of nature or nurture, but either way, I'm pretty proud of the result. This afternoon on the way to school Natalie discovered an unopened Valentine from her classmate, Ian. Inside the envelope was a single heart made from clay that he had painted himself and signed with his name on the back. "Aww...Mom, I'm taking this with me when I go away to college because when I'm far from home I want to have my memories with me. 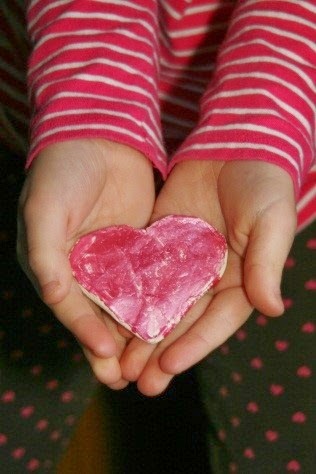 This heart is a gift of love,” shared Natalie. All my life I've been a collector. Not a traditional one in the sense that I gather items of value like antique porcelain dolls, Coca Cola memorabilia or rare coins. Maybe some would call me a pack rat, but I disagree…I’m just a sentimental one. It’s true most of the items I've amassed over the years and deemed as precious wouldn't bring a dime at auction. When I was about nine years old and on a family vacation, I decided to start collecting thimbles. I made sure to pick them up in every state we visited. Over the course of several years, my collection grew quite large. I’m not sure why I chose thimbles. Maybe it's because many of the women in my life used their hands to create. My dad's mother was a master at crochet. She made all kinds of useful goods. I still have an afghan blanket she made for me more than 35 years ago, that not only keeps me warm, but makes me feel somehow closer to her even though she passed away a very long time ago. My mom's mother was an avid quilter and during her 40 plus years as a grandmother, she tried to create a quilt for each and every one of her 36 grandchildren. I was the 5th grandchild born and feel lucky to own a piece of her handiwork. Probably my favorite treasures come in the form of mail. I have a large Rubbermaid full of letters, cards, and even a few faxes received while working aboard Carnival's M.S. Fascination. In fact, chances are good that if you ever wrote to me, I saved your letter --some from friends and family and even a few boyfriends that date back to 1984. Each one is like a little time capsule that reminds me how much I am loved and have been throughout my life. Like the note I received from my dad the first year I went off to college. It was the first and only time he has ever written to me. Growing up, he was the breadwinner and worked seven days a week to give my siblings and I a good life. My mom was the one who handled everything else from doctor appointments, school projects and carpools to grocery shopping and gift-giving. His note came at a time when my mom had been sending me care packages to my dorm filled with banana bread and cookies. My dad wrote, “I wanted to send a care package, but since I can’t cook, here’s $5. Go to Mrs. Fields on me.” And, although I’m pretty sure I used the cookie dough to fund a 6-pack of Milwaukee’s Best…I never forgot his loving note. I use an old printer’s box to house some of my favorite memories. 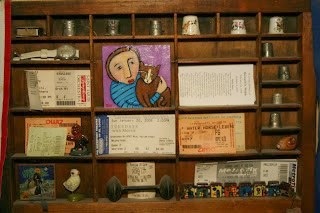 The tiny painting was done by my artist cousin, Sarah and the first ebay auction I ever won. The bracelet of tiny wooden houses was purchased while bumming around the mountains of Venezuela with my friend, Jacqui. It was a fun trip, but we nearly missed the boat! They were pulling the gangway and we had to jump across. We laughed after we made it safely aboard, but also breathed a sigh that we didn't have to spend the night in Venezuela with only a few bolivars between us. When I was young, it was popular for photo studios to offer locket-size photos. On the right side of the box, is a locket containing a photo of me with my cousin Molly. On the bottom right side of the box, is a buckeye. When I met Steve he told me he was originally from the Buckeye state. I told him I had never seen a buckeye. On our second date, he presented me with one. I carried it in my coat pocket for years. 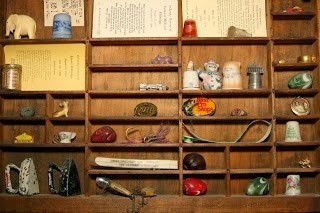 Recently my kids each brought in collections of their own to school to be put on display in their school library. Both enjoyed the attention and questions they received from friends and teachers about their caboodle of prized possessions. Later, Natalie’s teacher asked me if I collected anything. I told him no. Maybe because my collection is personal and probably most people wouldn’t understand. But, now I see…through the eyes of my own children that my compilation of stuff is important because I am a collector…of memories. 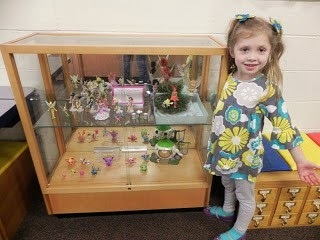 Natalie with her fairy collection. 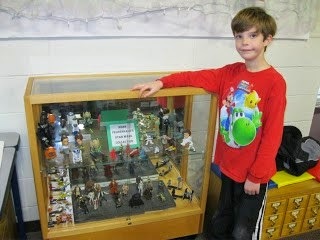 Noah with some of his favorite Star Wars collectibles. I am happy to be there! Thanks for having me. I hope your readership grows by leaps and bounds.